Carl McIntire used to write a feature history column for the Clarion Ledger. years ago in 1906 And this is one that he wrote on Mississippi’s first bridge. And one early historian asked in 1906 if it could be the bridge could be the first bridge in the nation – fluctuated in value from $1,000 to 30,000 to 800 in just a few years. Located across the Noxubee River in the southern part of Oktibbeha County, just above the Noxubee County line, it was a privately built and operated span on which toll was collected from all who passed over – human or animal, in all likelihood. Just what the tolls were is not told for this bridge, but if it was like others, as it probably was, the prices might have been like this” 15 cents for an adult, 5 cents for children, 3 cents per cow or horse and 5 cents for pigs or sheep by the dozen. At any rate, it was the only bridge on the only thoroughfare from east to west and was on the U. S. government road known as Robinson Road, the first to be built in the state. THE ORIGINAL LANDOWNER was a Daniel Nail, said to be a half-breed Choctaw. He sold his interest in 1832 to Grabel Lincecum for $500 and Lincecum built the bridge, probably in the same year. A year later, when Oktibbeha County was organized, the county organized, the county granted an annual appropriation of %000 for the benefit of its citizens. Apparently, the county residents could use the bridge for free, all others paid. Traffic must have been heavy in this era of the 1830s when the westward treks were underway by immigrants from the Carolinas, Georgia and Virginia. Many were heading for Texas, but it was in this period that many stopped and settled in Mississippi. In covered wagons, drawn by oxen, and with their cattle and other livestock along, the families had to cross the river and the bridge was here, for a fee. IT MUST HAVE BEEN a great business venture. In 1834, Lincecum sold out to McKinney Holderness for 1,000. He sold it some time later to Richard Watkins for $2,000. By then, Lincecum must have realized the bonanza he had created and almost given away in the first sale, so he and Dr. John Watkins bought it back from Richard Watkins, paying $5,000. They in turn, sold it to a Mr. Gooch for $20,000 and a Mr. Dulaney came along and grabbed it up for the bargain price of $30,000. He probably thought he had a bargain, for traffic must have been at its peak when he made the purchase. The value dwindled fast, it would seem for it was not a long time before he was selling it for a mere $800 to James Stewart. From there on there is no more story of the bridge, but most occurred during its lively period than just the sales. THE STORY IS TOLD that a tavern owner, whose place was only about a mile from the bridge tried to entice customers by informing them, in periods of low water, that the river could be forded a short distance below the span, thus circumventing the tolls. Owners of the bridge, whosoever it was at the time, naturally reacted to such information being glibly handled about and there was deputes, lawsuits and generally poor relations between the neighboring businessmen. At the price of the bridge would indicate, from sale to sale, it was a golden egg for a period. Then, at last, when Dulaney lost $29,200, in unloading it to Stewart, either there were some ways to ford a creek or a lot fewer people heading west. HISTORIANS who have recounted this bit of Mississippiana—including William A. Love, who wrote for the Mississippi Historical Society in 1908 – believed it was the dropping off of traffic that caused this deline in the bridge’s value. Beginning in the eastern part of Choctaw and the western portion of Oktibbeha Counties, the Noxubee River flows southeasterly to connect with the Tombigbee over in Alabama. It was considered the dividing line of the Choctaw Indians between their permanent home in the pine forest region to the south and their hunting grounds to the north. 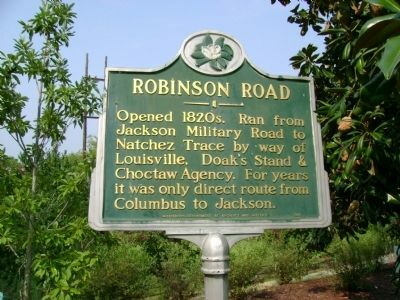 Only a mile and half from the bridge, to the east on Robinson Road, was the Choctaw Agency. It had been established soon after the Treaty of Doak’s Stand in 1820, when the Choctaws had sold part of their lands to the white man. It was at the agency that the Choctaws received some of the annuities granted to them prior to the later Treaty of Dancing Rabbit Creek in 1835. FOR THE CHOCTAWS, it was a prominent place and in 1827 they held their national council there, discussing at that time some of the details that were later written out in the Dancing Rabbit Creek treaty. Also, Humming Bird, one of the chiefs of the Choctaws, was buried there in 1828 with Colonel Ward, the Choctaw agent, giving him full military honors. After the second treaty ad until 1833, the spot was occupied by Col. Ward as the agent for the Choctaw families who had desired to remain in Mississippi and not join the others in the Trail of Tears: in new homes and hunting grounds in the Oklahoma Territory. When Ward, left, the place on the river where the agency had been became infamous. There were houses of entertainment, as they were called, and thefts and robberies became common. There were reports of people suddenly disappearing. Someplace close to the Noxubee River and along Robinson Road, better times were to come, and nearby, there had been better times. Rev. Cyrus Kingsbury a missionary established the Mayhew Mission along Robinson Road and in about 182 erected a log home nearby. His work drew many persons of religious or official prominence over the years. There were other crossing places on the Noxubee River, most of them ford, but a few ferries, not far from the bridge. IT WAS JUST BELOW one of these ferries, known for Starnes, its operator, that Pushmataha had been born in about 1784. A large black oak tree was for years pointed out as the place of the famed Indian’s birth. Pushmataha, of course, became one of the most prominent figures in Choctaw history. He served in the U. S. Army in the Creek War of 1813 attaining the rank of lieutenant colonel. He was a major participant in the Treaty of Doak’s Stand and when he died in Washington, D. C. was given full military honors when buried in the Congressional Cemetery. Not far below the bridge near where Shuqualak Creek enters the Noxubee was another historic site for the old river. It was here that the famous international bail game of the Creek and Choctaw Indians was played in 1782. FIFTY CHAMPION PLAYERS from each side and several thousand spectators from each nation were on hand. It was a long hard struggle and the Creeks won. Immediately after the game a battle ensued and there were many losses in a day and night of fighting. The chiefs finally were able to quell the hostilities and the dead were buried, the survivors departing in peace. So goes the story of the river and the first bridge–in the nation?